William Lambers is an author who partnered with the UN World Food Programme on the book Ending World Hunger. His writings have been published by the New York Times, Huffington Post, Boston Globe, Cleveland Plain Dealer, Cincinnati Enquirer, Buffalo News and other media outlets. This Thanksgiving season take a moment and let your mind wander back to the autumn of 1947. That's when the Greatest Generation again rose to meet a challenge and help those in need. They started the tradition of setting aside a plate at the Thanksgiving table for a "silent guest," one of the world's hungry. World War II may have been over for two years, but the aftermath left Europe suffering from food shortages. Drought had become a new enemy in that summer of 47, lowering crop production. President Harry Truman was so alarmed about food shortages in Europe that he addressed the nation multiple times. So too did Secretary of State George Marshall. You knew the Greatest Generation was going to do more than just listen. They took action! Governors from all states endorsed the "silent guest" Thanksgiving. Families would set aside a place at their holiday meals for this "silent guest." They mailed in donations to pay for feeding their "silent guest." These funds bought CARE packages of food for hungry families in Europe. What a magical thing to have American families at Thanksgiving feeding those a world away. That is exactly what happened every time someone fed "silent guests" during holiday meals. The idea was crafted by Iris Gabriel, an activist who once had ambitions to be an actress. That dream was left unfulfilled. She found instead a hero inside her, championing the rights of children whom her 'silent guest" plan fed by the thousands. Also on Thanksgiving Day, Catholic Relief Services held food collections at churches bringing in even more donations. That was not all either. Now everyone loves trains. That is what Americans used to help feed the hungry in the fall of 1947. They started the Friendship Train, an idea generated by columnist Drew Pearson. 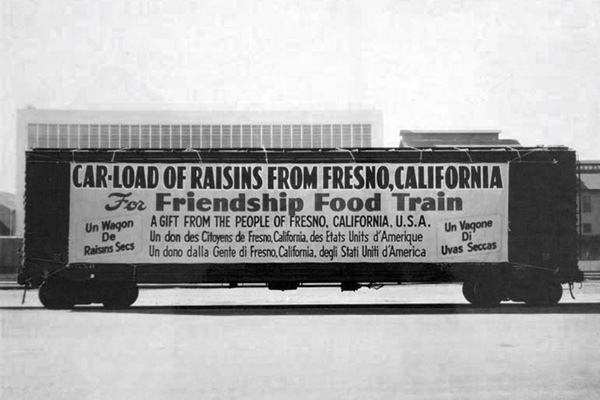 The Friendship Train went coast to coast picking up canned goods in cities and towns. Citizens dropped off the food or money when the train would arrive. When the train reached Hartford, Connecticut, Mayor Edward Allen called the spontaneous generosity "incredible.” Mayor Carl Rich of Cincinnati proclaimed Friendship Train week and citizens loaded boxcars of food. People from Canada even donated money. Hershey, the famous candy company of Pennsylvania, made a big donation to the Train. When the Friendship Train reached New York, the food had to be loaded onto ships for the trip to Europe. Dock workers at Pier 42 on the North River gave up their Thanksgiving holiday to get the work done. The New York Times reported that Pope Pius loved the Train too. All these efforts at feeding the hungry preceded the famous Marshall Plan, which ultimately rebuilt Europe. Congress passed the Marshall Plan in 1948, no doubt encouraged by the actions of the citizens in feeding the hungry. Today we need more than ever to feed a "silent guest" at our Thanksgiving meals. We need another Friendship Train. Look at what is happening in the Middle East and Europe. There are millions of hungry refugees from the civil war in Syria. There are more refugees today than any time since WWII. These are hungry men, women and children who once had regular lives like us. Now they have lost everything and depend on the UN World Food Programme (WFP) just to eat. Since the war in Syria is so massive and prolonged, hunger has escalated. Funding is running low for food aid. The WFP has cut rations for war victims. People in war-torn South Sudan are so low on food they live off leaves or water lilies. Refugees from South Sudan have fled to Ethiopia, but that country is now on the brink of famine too because of drought. The war in Iraq against ISIS has left millions hungry. Yemen, Central African Republic and the Ukraine are also facing war and hunger. Earthquake victims in Nepal need food. We can’t let children starve from malnutrition. We cannot do that when there is enough food in the world. The true meaning of Thanksgiving is so all can share the plentiful food. We can do this by feeding "silent guests" this holiday season and donating to WFP and charities fighting hunger. Food is life, friendship and hope. With this spirit, we can bring food and peace to the world.